(Bloomberg) -- Singapore has a message for shipping companies considering cheating on rules starting next year to combat pollution to save a few dollars on their fuel bills: don’t. Captains and owners of vessels that burn overly sulfurous fuel in the Asian country’s territorial waters could face as long as two years in prison from the start of 2020, according to the Maritime and Port Authority of Singapore. If enforced, such a penalty would probably be among the strongest deterrents yet to dodging regulations that are supposed to cut emissions of a pollutant blamed for asthma and acid rain. From next year, the ships must emit 85 percent less sulfur in most parts of the world than they do in most places today. The world’s second-biggest port said that ships that fail to use an approved abatement technology such as a scrubber, alternative fuel or compliant fuel will also be considered non-compliant. The MPA didn’t clarify precisely what rule infringement would incur a prison sentence. Other penalties include a fine of up to S$10,000 ($7,400). Based on precedent in the the U.S., the harshest penalties would likely be imposed if there were exacerbating factors like falsification of documents or obstructing justice, according to Magdalene Chew, a director at AsiaLegal LLC and Wole Olufunwa, a senior associate at Holman Fenwick Willan in Singapore. “Presumably, this may be used as a yard stick comparison for what penalties imposed for breach of the sulfur cap may look like,” Chew and Olufunwa, who specialize in shipping at the law firms, said in a joint email. 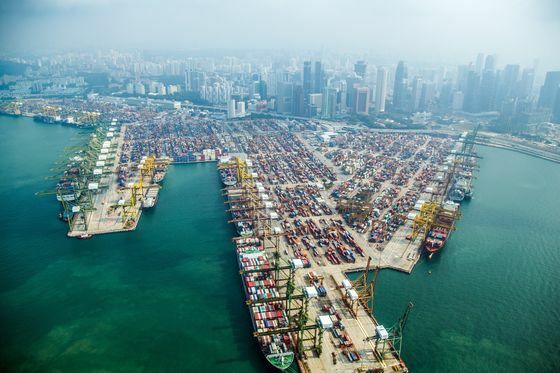 The most severe penalty Singapore ever imposed for breaches of maritime air pollution regulations was more than two decades ago, said Chew and Olufunwa. Then, a vessel’s owners, master and agents, who all pleaded guilty, were fined S$400,000 each for “flagrant disregard of any concern for the marine environment.” The ship’s master also received a three-month prison term for an oil spill charge, according to the law firms. Such penalties matter far beyond the confines of individual port states because there’s an expectation that many owners -- particularly in Asia -- could start by ignoring the sulfur-emission rules. The extent to which that happens will have an impact on the maritime industry’s fuel-buying patterns. However, with thousands of ships each year stopping at the island state to refuel while en route to other parts of Asia, the country’s deterrent could make many owners -- and ship captains -- more wary of cheating. The penalties could mean tougher times for shipping firms as they prepare for the rules. To comply, companies can either purchase more expensive, cleaner fuel with less than 0.5 percent sulfur content, or they can install pollution-reducing scrubbers that let them keep using oil with a higher sulfur content. To make matters worse, analysts question whether sufficient low-sulfur fuel will be available in time. "MPA is also working closely with the industry to ease the transition to the requirements under the IMO 2020 regulations," a spokesperson said, adding that the authority has issued technical guides, along with the Singapore Shipping Association, on options available for ship operators to comply. The authority will inspect both Singapore-registered ships as well as foreign-flagged vessels visiting the port, and employ fuel-testing service providers for detailed laboratory analysis of fuel samples. It will also deploy electronic systems for ships to declare their method of compliance before arrival. Along with other nations, Singapore already banned open-loop scrubbers from discharging washwater, the waste liquid containing impurities after airborne sulfur emissions have been removed.